X-ray system for chest - Fluorograph FDIP-08 (07) by «KUFP «Medaparatura» is intended for screening radiographic researches of thoracic organs (supplied with X-ray protection cabin -08 (07)). We set the digital detector ИОНА-Р-4000, manufactured by SPA «Teleoptik». Digital x-ray image detectors are equipped with the original software. There is an ability to operate the software in a unified (uniform) system with a hospital-wide server. X-ray tube. We recommend using X-ray tubes with a minimum size of the focal spot with low-dose digital x-ray image detectors. For example the focal spot of 0.6/1.5 or 0.6/1.2. We recommend using Italian tubes - X42 in housing C40 (with a focal spot of 0.6/1.5), X76 in housing C40, produced by company IAE (with a focal spot of 0.6/1.2), X39 in housing C40, produced by company IAE (with a focal spot of 1.0/2.0) in fluorograph (X-ray system for chest) FDIP-08 (07) and FDIP-12 (11). This tube has an optimal ratio of "price-quality". High-frequency power supply produced by CPI (Canada) - CMP200, 32 kW, 380V/ 3 phases, or CPI generators - CMP150 ENERGYASSIST 22 kW (32 kW), CMP200 ENERGYASSIST 32 kW, 220V/ 1 phase, with the capacitor energy storage. As an option we can supply monochrome diagnostic monitor JUSHA (optional WIDE) and medical printer for hard copies of fluorograms on a special x-ray film. Digital Matrix system allows obtaining high quality image in a few thousandths of a second. With the help of it the image corresponds to the full-size plain film according to the diagnostic descriptiveness. Digital X-ray image of high quality in many cases allows to diagnose without additional testing. Moreover, the software that comes as a part of computer workstation enables a radiologist many options: control the brightness and contrast of the image, measuring distances, angles, and areas, i.e. helps the doctor to identify pathological aberrations. The program also allows you to manipulate the «rigidity» of already taken fluorograms, highlighting the structure of the lungs or bone. 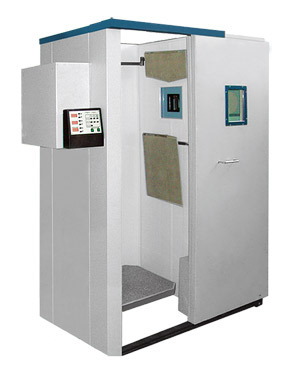 X-ray protection cabin which has absorption of 1.35 mm lead equivalent, reduces the radiation load on the staff almost to the level of natural background, so the system can be placed next to the doctors, even in areas of limited space, such as a wagon with mobile fluorograph system (mobile X-ray system for chest). This is a classic design of fluorograph (X-ray system for chest). Manufacturer is «Kyiv's Union Factory Production «Medaparatura».